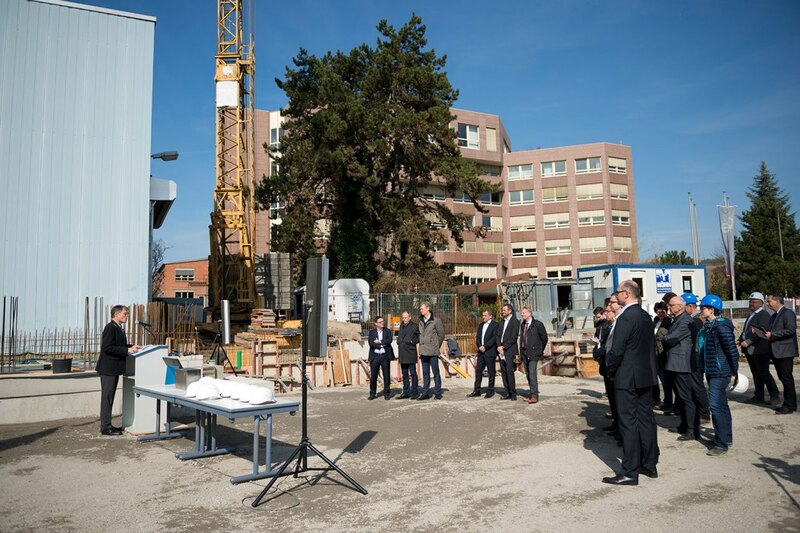 Printing presses maker Koenig & Bauer (KBA) has laid the foundation stone of a new digital and flexographic press demo centre at its Würzburg parent plant in Germany. The 21,164m³ demo centre represents an investment totalling €6m including technical infrastructure. It features an usable area of around 2.100 m². It is the latest in a series of new buildings at the Würzburg site, following a new logistics centre and design building in 2001, two new production halls in 2003 and 2008 and a new foundry in 2012. The new demo centre will be developed to offer presentation facilities with easy access to Frankfurt International Airport for customers coming in from new markets. As counterpart to the demo centre for sheet offset presses and processing systems at Radebeul in Saxony, the new demo centre in Main-Franconia will feature a RotaJET digital printing press for commercial, publication and decor printing. It will also house a newly developed sheetfed flexo press from KBA-Digital & Web for direct printing on corrugated cardboard. The centre is due to be ready for occupancy in autumn 2017. In addition to customer demos, testing new developments is also planned. At the ceremony, KBA CEO Claus Bolza-Schünemann noted that the company is now focused on growth sectors such as packaging, digital and industrial and functional printing. And now, about 70% of the company’s revenue comes from the packaging sector. Bolza-Schünemann said: “KBA-Digital & Web builds the world’s largest inkjet roll-fed rotary presses and in future also high performance sheetfed presses to meet the growing demand for corrugated cardboard packaging. “Our Italian subsidiary KBA-Flexotecnica offers technically outstanding flexo rotary presses for film, paper and lightweight cardboard packaging. “With the widest portfolio of all manufacturers, KBA Group offers print solutions for virtually all markets. We want to present our systems for the above growth sectors live in action at the new demo centre." Image: The new demo centre in Würzburg is being built directly adjacent to Koenig & Bauer AG's administration building. Photo: Courtesy of Koenig & Bauer AG.